In 2016, 13.9% of Georgia residents were uninsured. For uninsured individuals, comprehensive mental health care, including therapy, is often a rare commodity. The following resource list contains agencies in Georgia who offer affordable counseling, and other mental health services. Low cost clinics are available in two locations: Norcross and Gainesville. In addition to counseling, psychological assessments are available at a reduced rate. A nonprofit, ecumenical organization offering low cost counseling, pastoral care and education to individuals, couples, and families. They have several counselors in training. Located in Decatur, GA; 404-636-1457. A Department of Psychiatry training program for new psychiatrists, providing evaluations and individual, couples and group therapy, as well as medication management, on a sliding fee scale; 404-727-0399. A Psychology Department therapy training center providing individual, couples, family and group psychotherapy on a sliding fee sale. They also provide a variety of lower cost psychological testing, including IQ, learning disability, attention deficit disorder and neuropsychological assessment services; 404-727-7451. The publicly funded adult and youth community-based mental health service system in Georgia, provides affordable counseling treatment for mental health and addiction disorders; 404-657-2136. A Georgia State Department of Psychology training center for new therapists providing individual, couples, family, group psychotherapy, and psychological testing on a sliding fee scale; 404-413-6229. A therapy training center providing some low fee counseling through their “Project Open Heart” program. Located in Inman Park, near the Marta station; 404-658-1222. An organization that provides health, career and human services, including low fee counseling services, serving people of all faiths. They have several locations and counselors in training; 770-677-9305. Located off Clairmont Road just north of the Emory campus; 404-321-4307. A nonprofit community counseling center located in Sandy Springs, 404-256-9797, and Cobb County, 770-541-1114. A Mercer University training clinic for new therapists, providing couple and family therapy; located at Piedmont Hospital, near Buckhead; 678-547-6789. A nonprofit community counseling center and training center for new therapists providing affordalbe counseling services to adults, located in Atlanta, on Buford Highway; 404-321-0305. Website where therapists register and clients can search for therapist by zip code. This site is for discount sessions $30.00-$50.00 per session. Client’s must pay an initial registration fee of 50$. Individual therapist set their own prices for their counseling services. The Mission of the Sage Center is to promote comprehensive wellness in the community by providing quality support services through counseling, consultation, education, and mentorship to individuals, professionals and organizations. Sage Center is committed to serving with integrity, compassion and respect in a balanced and collaborative environment. Reduced fee counseling services available now between $40 – $95. Clients seeking services through the STEP program may complete a short application at www.sagecenteratlanta.com that will help identify the counselor that can best meet the client’s needs and also determine fee. For more information or to inquire about services, please visit www.sagecenteratlanta.comor call Sage Center at 404-419-4221 Extension 103. Sage Center is conveniently located in North Atlanta near interstates 85 and 285 inside the perimeter. An outreach of St. Luke’s Episcopal Church serving people of all faiths, providing sliding fee scale. Located in downtown Atlanta just south of Crawford Long Hospital off of Courtland Street; 404-876-6266. Authentic-Life Counseling does not have first hand experience working with any of these agencies. 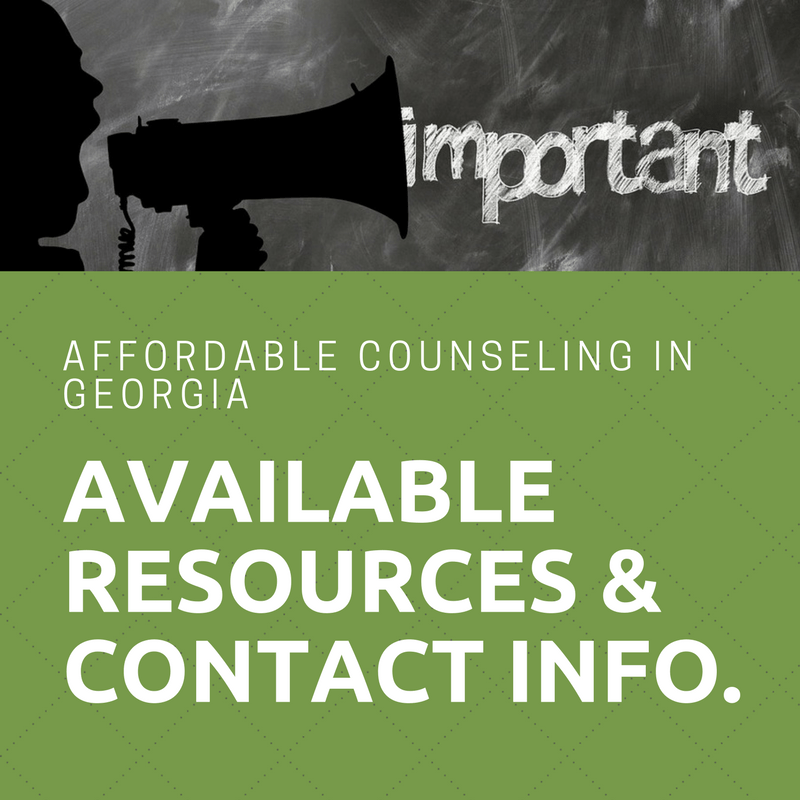 The reference list of agencies offering affordable counseling in Georgia has been provided as a resource. Special thanks to Allyce Wellons, psychotherapist, who originally posted this content. Hi, my name is Diane and I provide a variety of counseling services to foster the emotional and psychological well-being of individuals and families. I believe optimal health requires achieving balance between our mental, physical, emotional and social functioning. I consider it an honor to help people find this balance and improve their lives. To view more about me and my methods, please click to read more. Below you will find documents that need to be filled out for every patient. Please bring these to your first session. If you have any questions, do not hesitate to contact me. I am happy to help! © Copyright 2012 Authentic Life Counseling and Psychotherapy. All Rights Reserved.